LOUISVILLE, K.Y. 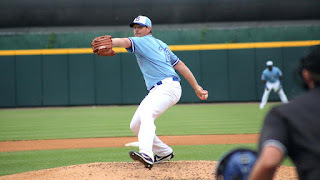 -- The Bisons suffered losses in both games of the doubleheader Tuesday night and fell in Wednesday night's contest but the narrative flipped Thursday as Buffalo snapped a three-game skid and avoided the sweep. Behind one of his best starts of the season, Nick Tepesch helped the Herd claim a 4-3 win over the Bats from Louisville Slugger Field. Louisville threatened a comeback in the bottom of the ninth by getting within one run of the lead, but Justin Shafer closed the game out for the save and stranded the tying run at second base. Tepesch made his first start since being activated off the disabled list on Tuesday. He threw seven innings and was backed by early run support. Tepesch allowed one earned run on three hits without giving up a free pass. He also struck out two batters. It was a nice bounce-back start for the 29-year-old, who let up eight runs and twelve hits in his most recent outing on July 15. Tepesch primarily kept the ball in the infield and induced 13 groundouts compared to just four flyouts. The right-hander was highly efficient and threw just 78 pitches--54 went for strikes. He faced three batters over the minimum and retired the side in order five times. Tepesch's quality outing enabled him to capture his first win on the mound with the Bisons this season. The Herd got off to a fast start as it secured a four-run lead by the end of the second. Gio Urshelaput Buffalo on the board in the first with a sacrifice fly. In the second, Jonathan Davis' timely two-RBI double scored Jason Leblebijian and Darnell Sweeney. Both singled earlier in the inning. Davis crossed home on a single by Richard Urena. Rowdy Tellez notched his second-straight multi-hit game with a pair of singles while Sweeney also added two singles to the Buffalo cause.